Off season basketball begins in June and it is now in session. It is paramount that work on the offensive and defensive systems be mastered. Coaches must understand how important it is for their athlete to move better so they must include speed training into each practice. As all coaches know, there isn’t a lot of time to do both system development and athletic development equally at the beginning of the season, but there is a way. One of the most important athletic skills a basketball team needs to be able to perform is cutting or simply change of direction. If you can perform this skill, you can move well on both the offensive and defensive side of the ball. How can your practice breakdown to accomplish this? When I was coaching basketball and my team would work on defense, whether it was our shell defense, individual breakdown, or 5-on-5, I put a huge emphasis on body position and intensity of speed. I wanted them moving as quickly as possible, but maintaining great body control. 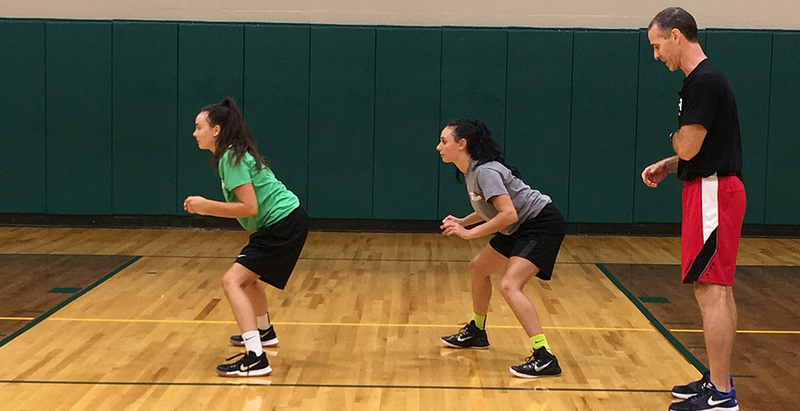 On the offensive side of the ball any time we cut to the basket, change direction on the dribble, or fill an open spot I wanted the girls in a great athletic stance and using proper acceleration and deceleration angles. How can you police their movement when it is easy to get caught up on the offensive or defensive system? For me it is simple. As movement specialist, when I see an athlete make a poor cut or defensive slide I immediately look at body position and effort. At this point, I blow my whistle and make a big deal out of it. The rest of the team hears it and sees me address this issue so they are less likely to make the same mistakes. The way that I made sure my team had enough repetitions is to drill the basics of basketball offensive and defensive which leads to great athletic movement. We spent 8 to 15 reps for each player on a particular movement (the entire team is doing this at the same time), yet it relates to the offensive and defensive system. Take cutting to the basket for example; we will drill a particular cut from the wing, top, or corner for several minutes. This way I can guarantee the players are getting better at all areas of the game including athletic development. Choosing your drills wisely to develop certain skills will be important. Don’t just do something, do everything with a purpose. Speed training during a sport can be a challenge if you don’t organize yourself. Having a tool such as On Court Basketball Speed will save you so much time, because you will completely understand how to teach all the movements you will need during your practices. To learn about this, click here to learn more about On Court Basketball Speed.